2020 Vision Quest | Peak Potential is fast approaching — Won’t you join us? A leader’s job is not to do the work for others, it’s to help others figure out how to do it themselves, to get things done, and to succeed beyond what they thought possible. 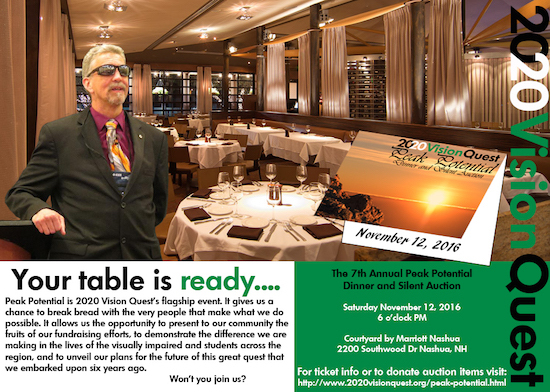 Our Seventh Annual Peak Potential Charity Dinner and Auction is November 12. Although you can buy your tickets up until November 1, we set our personal goal this year to sell out by October 12, a month before the event. We urge you to help us reach this goal! We accomplish many great things with 2020 Vision Quest’s yearly efforts. Each year’s success is largely based upon the support we receive from you and through your efforts on our behalf. Our team of volunteers, myself included, dedicate much time and effort because we believe in what we are able to achieve with your help and we make every effort possible to be worthy of your support. As the quote above suggests, we believe our school presentations help demonstrate a leadership of hard working, positive-minded achievers, while the organizations we support fiscally provide training and partners to strive further than many thought possible. Peak Potential is a night to celebrate! We are well on the way to our goals of sponsors and ticket sales but we are not there yet. Help us share our goal of a sell-out–and better still, help us reach this goal by becoming part of our team right now. We certainly have much to celebrate and more importantly we have so much more we can accomplish with your choice to be part of our team. I know some of you live far away (though there’s always the option to stay at the hotel that evening, as I’m doing). I know for some of you this isn’t the right opportunity and I appreciate the encouragement you share in other ways. I also know that we are over 2/3 of the way to a sell-out and already at numbers that would have sold out all our prior smaller venues. But I have a goal to share the evening with a full room of friends and supporters who will make this year our most successful event, and I’m asking you to help make this possible. Please take a moment to invite a friend or two, buy a table or a ticket, consider a sponsorship, or consider an item for the auction donation. I have been fortunate to hear from so many how much our mission matters. For many, you won’t have to look far to find the same reports because it is likely we have had a positive impact in the life of someone you know. Come to the event and you will get to understand this and more firsthand. Join me in spending an evening with a community of outstanding people who want to help others reach for the highest peaks and who provide support for the deepest valleys.